This post contains affiliate links which means if you buy products through links in this post I may earn a commission. Read my full disclosure. Do you have a little girl (or not so little girl) obsessed with sloths this year? One of my daughters is all about sloths, and I’m so excited about all the cute products available this year. Won’t a sloth themed Easter basket be so much fun? 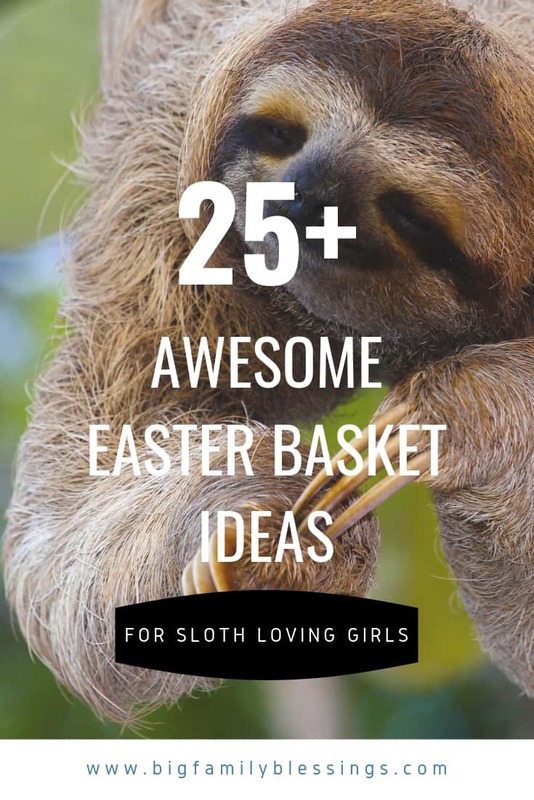 Today I’m sharing some of the adorable sloth Easter basket fillers I’ve found so far. You’ll find sloth themed items for every sloth loving girl in your life- toddler to teen! I usually reuse the same Easter basket year after year, but this year I’m leaning toward getting her a sloth basket or bag. One can never have enough baskets or bags, right? This wheeled duffle bag would make a great Easter Basket, and would be useful for years to come! Actually there is a whole line of sloth luggage to match it too! This adorable sloth lunch tote would be another great Easter basket idea, that would continue being useful. Or, choose a sloth backpack to fill for Easter. Does it get any cuter than a cuddly sloth in it’s own bag? Well, just maybe with a Mama and baby sloth? Or a sloth that can hang-on around your neck? Or a life-like sloth with bendable limbs and hands that clasp with self-stick tabs? There are just so many cute sloth plush toys! Play hide and seek with these two cute stress relieving sloths. Pretend with your own ‘live’ sloth. Or annoy siblings with this sloth popper. What girl doesn’t love jewelry? How cute are these sloth slippers? This little backpack is cute enough for teens, even though your littles will want it too! And this bag is too cute too! I might have to get these sticky notes for myself! Here is a set of sloth notebooks. And a spiral notebook too. Why not finish it off with a sloth pencil case? Adult coloring books are great even for kids. At our house everyone from age 7 on up to adult loves a good ‘adult’ coloring book! These magnetic page markers are so useful and cute! If your girl loves to craft and sew, this Sew Your Own Sloth is perfect! This sloth mug is a great Easter basket filler for a tween or teen. This pillow – sequins and sloths!! This ceramic sloth planter is great for any girl’s bedroom. My daughter already has this fun travel mug for her hot chocolate, but I might have to get another for myself! Who wouldn’t love this adorable stainless steel water bottle. With all these adorable products, your daughter’s sloth themed Easter basket is going to be overflowing with cuteness! Amanda is an adventurous single mom of six based in southern Virginia. She’s teaching her crew to live life to the fullest whether they are home on the farm or trekking through a new concrete jungle. She's passionate about intentional mothering through life’s joys and challenges, and learning to embrace the gift of each new day together.